In the last chapter, you learned how to customise the width of a track. We didn’t concern ourselves with figuring out the appropriate width for a track though, but only have to control the width. In this chapter, I will show you how to use Kicad’s built-in track width calculator to calculate (instead of guessing) the minimum track width. Notice that I used the word “minimum”. I did this because in general, bigger track widths are better, and the Kicad’s calculator will give you the minimum width for which your board can operate properly based on the information you entered. This is why very ofter, at least for hobbyist PCBs, you can safely skip the calculator and just choose large width values with a lot of “margin of safety” in them. This will become more clear after you complete this chapter. Start the Track Width Calculator from the main Kicad window. To start the calculator, go back to the main KiCad window and click on the PCB calculator button. The Track Width Calculator is in the second tab of the PCB calculator app. Click on the second tab, ‘Track Width’. We know that from the documentation of our main component, the RF24, that at peak it will draw 40 milliamps of power. Type this figure in the Current field of the Parameters group, in Amps. So, you should type “0.014” (A). For the temperature rise, we should set it 20 degrees Centigrade because I don’t see that this component will be operating in temperature variations more than 20 degrees above room temperature and below room temperature. Therefore, a 20 degrees spread seems like reasonable value here. The conductor length is not going to be more than 20 millimeters. You can measure that with the measurement tools that I showed you earlier but I don’t think that the conductor length is going to be more than 20 millimeters. We don’t need to be too accurate about this in our circuit because it is a low frequency, low power circuit. If you were working on a high-frequency circuit, parameter like this start to become very important. Let’s leave that as 20 millimeters as the conductor length. After entering the desired values in the Parameters group, the calculated Trace width appears in the External layer traces group, on the right side, in the Trace Width box. You can see that as I am filling these values in the parameters top left corner of the calculator, the calculator is automatically calculating the trace width and thickness for these characteristics. You can see in the External Layer Traces, the minimum Trace Width is calculated to be 0.00054mm. This is the minimum trace width that would allow for this much current to flow through at this temperature rise for a conductor that is that long. In the previous chapter, we set the ground traces to 0.381mm. This value is much, much larger than the calculated minimum. We are well and truly covered in terms of trace width. This is just confirmation that the thickness that I have chosen is sufficient. The Track Width calculator contains the Internal Layer Traces group. 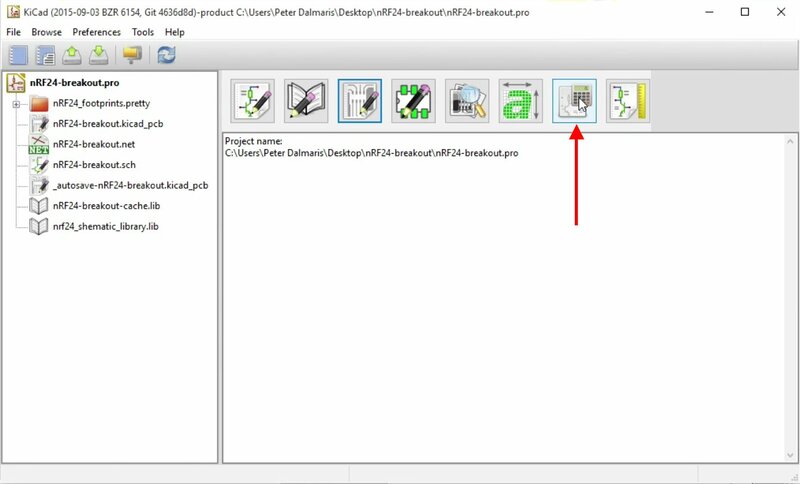 In it you will find the appropriate trace width for a trace that placed inside the PCB, as opposed to its surface. 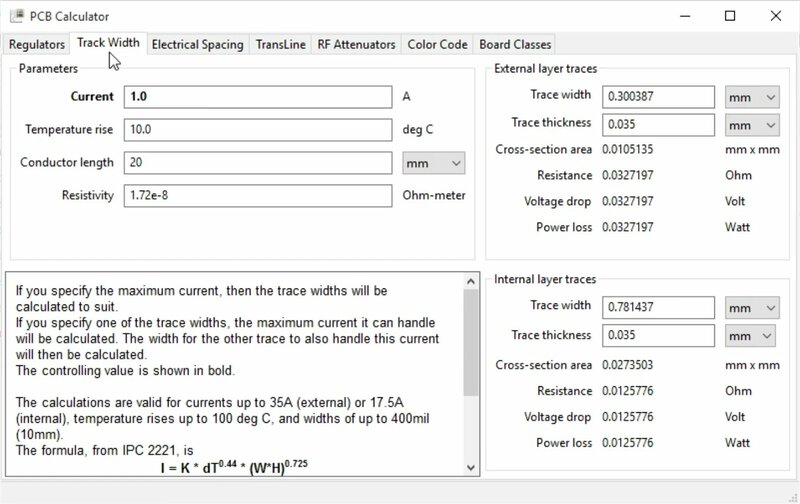 Notice that the track width calculator contains a group titled “Internal layer traces”. This group contains calculations for tracks that are placed inside the PCB, as opposed to its surface. In our example, the traces are all on the top layer. In the next two projects, they traces will be in either the top or the bottom trace. 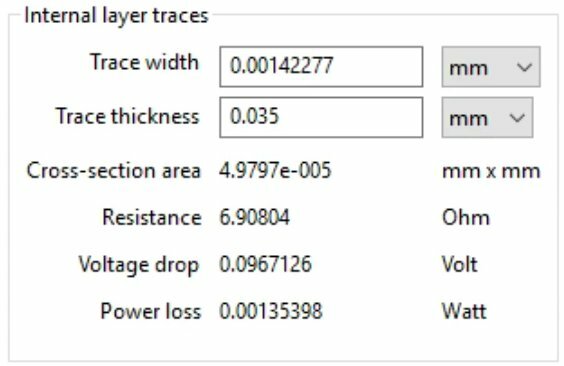 If you happened to be building a PCB with more than 2 layers, the you will need to use the numbers in this group to work out trace widths for the internal layers. Based on the calculator findings it turns out that our current width for the Vcc track are orders of magnitude more than the minimum. But it’s better to be safe than sorry. This means it is better to have a wider track then a narrower track. These tracks are well within the minimum so I’ll leave them as they are. Before we end this chapter, do an ERC to make sure that we haven’t violated any rules. In the next chapter, we will add copper fills to the board.